In celebration of the emancipation of slaves in the U.S. in 1865, this holiday is now being celebrated around the globe. There still remains a long way to go to equality, but many hold this day as representative of a watershed moment for oppressed people everywhere. Community radio stations around the U.S. are holding call-in shows today for people to express their feelings about the day and what it means to them, as well as what still needs to be done. 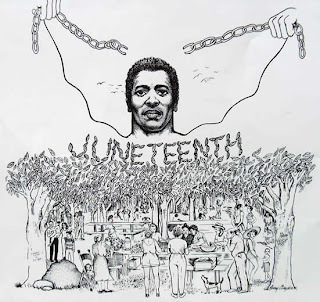 Check out juneteenth.com for more information on the holiday and events that may be taking place near you. Labels: being human, politics, poverty, U.S.
cool post for an important day. i'm surprised that there wasn't more attention given to it. at least there wasn't in my area.